SoftPlanet Software Assistant is the PUP that uses misleading techniques to prevent removal. Use Reimage to locate malicious components and get rid of them faster than with uninstall instructions. A full system scan blocks virus reappearance and prevents traffic to malicious domains. Does SoftPlanet Software Assistant need removal? How SoftPlanet Software Assistant PUP travels? 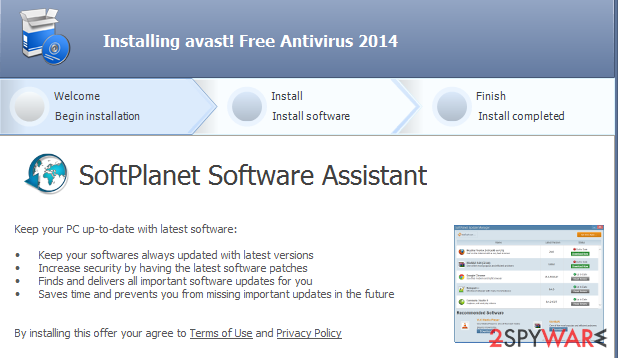 How can I uninstall SoftPlanet Software Assistant virus? SoftPlanet Software Assistant by the SoftPlanet corporation is a potentially unwanted program (PUP). It means that it is not recommended using. However, people quite frequently download it via the developer’s website (SoftPlanet(dot)com) and other download websites. Besides, many people have reported that it has entered their computers right after installing Avast! Free Antivirus and other AVSoftware from questionable download websites. On top of that, our research team has revealed that SoftPlanet Software Assistant is also commonly spread in one pack with freewares and is responsible for injecting other potentially unwanted programs like, for instance, Conduit, Amazon Toolbar, Pc Optimizer Pro, and many others. Therefore, as soon as you install SoftPlanet Software Assistant virus, you may find your web browser’s settings corrupt. In other words, your default start page, search provider, net tab window may be replaced by some doubtful search provider, various toolbars may be installed without requiring your permission, and so on. Besides, you may start receiving catchy-looking SoftPlanet Software Assistant ads on each website that you are visiting. In addition to that, this browser add-on is not recommended using if you want to prevent privacy-related issues. Once installed, it may activate tracking cookies and start collecting user location data, “name, surname, address, phone number, email, fax, social security number, IP address and other Data describing to the User’s identity or technical access to the Site by the User.” Therefore, if SoftPlanet Software Assistant PUP has landed on your PC by accident, you are strongly advised to launch Reimage and remove it with the whole bundle that it might have inserted in your PC’s system. As we have already mentioned, SoftPlanet Software Assistant can be downloaded on various freeware sharing websites, peer-to-peer sites, and other download websites. Besides, its developer (SoftPlanet) also has the official website and provides people with a long list of both well-known and doubtful programs. Unfortunately, but it can not only be downloaded with a reason. It may also infiltrate your PC without requiring explicit authorization. That’s because it spreads via software packages. Therefore, whenever you decide to install a freeware on your computer, take some precautionary measures because you may end up with a whole bouquet of potentially unwanted programs. That’s why no matter whether what kind of program you decide to install, make sure that you select Advanced or Custom installation option and carefully check if your selected freeware carries ‘optional downloads’ or not. If it does, deselect each of them and only finish to install it. When in the Add/Remove Programs/Uninstall a Program, look for SoftPlanet Software Assistant and related programs. Click ‘Uninstall’ and then OK to save the changes. This entry was posted on 2015-10-06 at 23:21 and is filed under System tools, Viruses. You can quickly scan the QR code with your mobile device and have SoftPlanet Software Assistant manual removal instructions right in your pocket. How did you remove SoftPlanet Software Assistant?